Prayer for the Christian is important. Praying to God is simply any conversation you have with Him. There are different types of prayer. Sometimes we are requesting things or answers from Him, for ourselves and for others. (Philippians 4:6-7). Other times we are in dire straights and need some help. Psalm 145:18 “The LORD is near to all who call upon Him, To all who call upon Him in truth.” Prayer is also giving thanks for all He has done for us and for who He is. No matter our circumstances, prayer should be our first step, before the doctor, before the lawyer, before the bank and credit cards, before counseling and self help books. First thing every day we should go to Him with a heart of Thanksgiving. The last thing we do before our eyes close to sleep is to end our day in conversation with Him. Notice I say conversation. Conversations are two sided. We have to be still and quiet enough to hear His voice. A great place to start is after a time of praise and reading His word, ask God how much He loves you. Then listen. 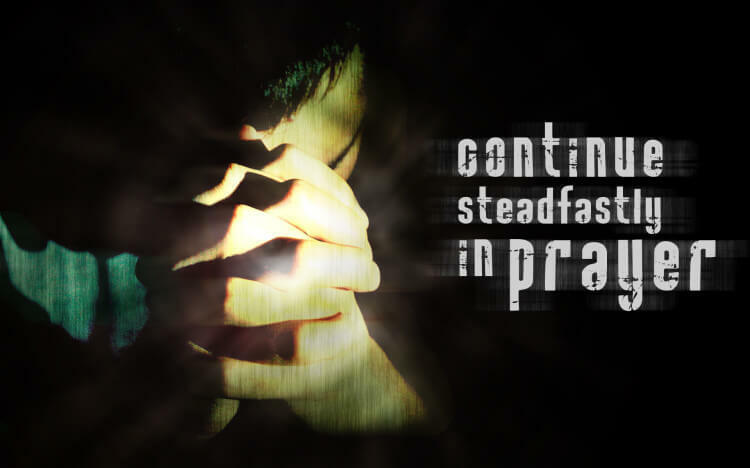 The verse in I Thessalonians tells us to “pray without ceasing”. I know the majority of us have jobs and obligations. Yes we need to verbally, out loud, pray to God. Use His word in our prayers. Recite His promises. But we can also pray silently, or pray in the spirit quietly. Another way to look at it, is that you are always open to hear from Him. Maybe your job takes a lot of concentration and you can’t let your mind go into prayer, but you can thank Him when you are done with a task, thank Him for helping you handle that difficult client. Be creative. Always pray before you eat. A trite, “Good bread, good meat, thank God let’s eat”, just wont cut it. You don’t have to pray until your food is cold, but be earnest and honest with God. Do you commute to work? Take that time to pray. So maybe you are thinking, “my life is pretty good, I don’t have that much to pray for.” Here are some suggestions for you. Of course, always pray for yourself and your family. Name their names, be specific in what they may need. Pray for the lost ones especially. Pray for our leaders and those in authority over us. We don’t have to like them, we don’t have to agree with them, but God says to pray for them. Pray for their salvation. Pray that they use Godly wisdom and pray for their protection. Ask God to bless them financially, emotionally, physically and spiritually. Pray that they have time to rest, relax, and spend time with their families. Pray that they are led by the Spirit of God, and are upright in all their ways. Ask God to give them Godly wisdom and discernment. Pray that they can stand in these evil days. Pray again for supernatural provision. That they lack no good thing. Think about the things you need and ask God to provide those things for your brothers and sisters in Christ. Pay attention to those around you, are they going through some hard times, go to God on there behalf. Again, make sure you take the time to listen to God. He may ask you to do something or direct you to pray in a certain way. A word of caution, if God reveals something to you so that you can pray, don’t go and gossip about it! Pray for their salvation. Ask God to open their eyes to their need of Him. Ask the Holy Spirit to prepare their hearts. “Get them”, “punish them”, “give them what they deserve” are all NOT good prayers. We didn’t get what we deserved. Ask God to forgive them. God’s desire is that all are saved. Jesus died for all men. We shouldn’t write off anyone. Like most things you have to work at building a habit. Set time aside, on purpose to pray. You will see great changes take place. God’s word does not return unto Him void. When we pray according to His will, He does the miraculous. This entry was posted in Thoughts and tagged Bible, Christ, christian, Christianity, faith, family, forgiveness, God, God's word, hope, Jesus, Lord, love, Salvation, scripture.